Players each have a deck of 40 cards representing a team of five Heroes, each one of these with a specific role on the battle front. Each deck contains heroes special ability cards as well as action cards that display the tactical choices on the Lane such as: “Recall” a hero from the discard pile, “Last Hit” a minion to gain resources, “Play Safe” to defend the position on the board. Decks can be created independently by the players or can be constructed through an initial draft mode. 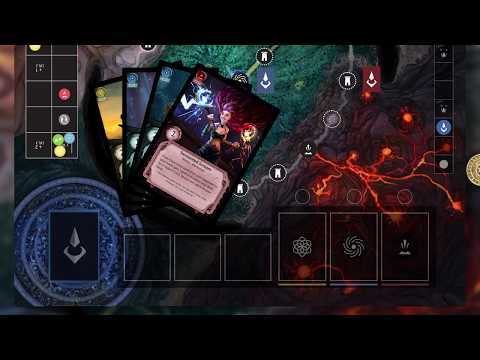 The most innovative element that makes the game different from other card duels, is the presence of the game board which represents a strategic map on which players’ choices, involving important hand-managing decisions, have a strong impact. Combat takes place every turn on each Lane. The goal of the game is to reach and destroy the opponent's base on the board. To do this, players line up their cards through a simultaneous action selection mechanism and once they have revealed them, they can trigger abilities, activate heroes Chains and play ‘Gank cards’ from their hand. Furthermore, to expand possibilities and strategic options, players deal with Boss-Events during the course of the game and also have the option to farm resources each turn, by discarding cards from their hand, in order to gain Gold (used to buy items) and level up the Heroes.